Do SIMPLE things to improve your way of life. Keep your spending SIMPLE .buy what you need not things that just clutter up your space. Eat a more SIMPLE diet choose fresh ingredients that aren’t enveloped in wasteful packaging. Choose recipes that are SIMPLE to create using ingredients that can be used in subsequent meals so nothing goes to waste. Enjoy SIMPLE pleasures like a walk in the park, a coffee with a friend or a wander through a museum instead of spending all your free time shopping. Keep your decluttering efforts SIMPLE by concentrating on one SIMPLE task at a time so you aren’t overwhelmed. Keep the decision making SIMPLE so you don’t waste time and energy agonising over what stays and what goes. My Declutter Decision Making Guide can help with this. Make housecleaning SIMPLE, the less stuff you own the less work there is involved in maintaining a clean and tidy home. And where am I at today April 22, 2014? I have done simple things to improve my way of life. I have kept my spending simple by not buying stuff I won’t use. My grocery cart is evidence of how I have kept my diet simple. Simple in its ingredients. You won’t find much in it other than fresh food. And as you know I have always kept my decluttering simple by mostly adhering to my average of a thing a day for the first 365 days and then at a slightly slower pace after that. And yet even at that pace my husband and I smoothly moved our belongings into a two bedroom apartment. And the decision making actually got easier as I went along even though I thought I was doing the easy stuff first. It just so happened that as I realised the joy of living with less I found it easier to part with stuff. Oh, and I can vouch for the fact that being decluttered has sure made housecleaning easier. Also many other tasks around the house have simplified too because I can quickly get at what I need for them. No more overstuffed cupboards making it hard to get at stuff. Choices have become easy because there is simply less stuff to choose between. Being eco friendly has even become simple because now it is just habit. It is also a fun challenge to find other ways to be so. During the decluttering process we also started the search for a home to live in. The one we finally found has also simplified our lives. I hardly use the car because nearly everything I need is within walking distance. Exercising is a joy because of the sights along the way. Our home is much small making housework simpler. I love my new simpler life and I would recommend it to anyone. And if you would like your life simpler to just make that one first step today, then another tomorrow and another the next day and before you know it your life will be simpler too. For those of you well into your journey remember that you can take it as far as you want. Declutter some out of date paperwork. Encourage family, friends and anyone who will listen to refuse, reuse, recycle and reduce. I’m kind of grumpy today. I was looking at the guest room which has been ripped apart because we moved something and I started to look through drawers. I thought, “Good grief, I do NOT want to do this right now.” Then I thought, “Oh boy, Colleen would kick me if she saw me flip-flopping like this.” Plus it’s dumb of me to whine about stupid THINGS (referencing back to Colleen’s post the other day). But reading your post today . . . you know what? It made me feel better, more grateful, less whiney. A financial site I follow uses the term “complainey-pants” and I am suddenly fond of that word. LOL Thanks for putting it all in perspective! I loaded the boxes in my truck this morning for donation on my lunch hour. I also have a bunch of drink glasses that I’m going to run over to a lady who collects them. Hi Michelle, good for you. Mind you it is easier for me because I don’t have to go to work every day so finding time to declutter isn’t hard for me. You are doing a great job so keep it up. Thank you for sharing the post once again. I also choose simple recipes to cook, so that I don’t have to spend endless hours in the kitchen. One pot meals are my favourite. Simple to cook, and fewer dishes to wash. And that in turn helps me keep my grocery shopping under control as well. Hi Saigeetha, I also choose recipes that are simple to cook, with not too many ingredients. Gotta love the old one pot meals, especially curries, which are my go to favourites. I cheat though and use curry pastes so I don’t have to store and prepare lots of ingredients. I choose wisely which brands I buy though, some are just awful, too Westernised. Great post to share again Colleen! Keep it SIMPLE, this sounds easy and it will have huge impacts over time if you SIMPLify your life. Thanks! I am proof of that. Right now it is 7:30am and I am almost done with my housecleaning for the week. I got and early start, 5:30ish because I have other more enjoyable engagements today. Keep in mind housecleaning for me includes dusting every surface including skirting boards, picture frames, sofas, chair frames, bed heads, computer and TV screens. Cleaning every hard surface, kitchen and bathrooms, cabinet fronts, inside microwave, fridge front etc. Sweeping and mopping the balcony. And of course all the usual tasks, vacuuming, mopping, showers etc. So the place is spotless when done. That doesn’t sound simple but it is really because this areas are limited in number and size. And when done I know I needed worry about allergies or doing much around the house for another week. Heck, I don’t need to clean MY house! I feel good just listening to Colleen clean HER house! ha ha ha! Wow, that is fast! I’m jealous. This sounds like something I should work toward. Thanks for sharing how simplifying your belongings has simplified your cleaning routine! Colleen, I’m all for simple. I just don’t see the need for much. There are some things we need but not much. I’m excited for how much better life is when lived simply. Me too Deb, me too. Life is good when it is simple. Sounds like a beautiful approach, Colleen. I’m going to keep working on gaining more simplicity. Good choice Lucinda. Who wouldn’t want more simplicity? Colleen – the thing that encourages me most is that you arrived in great place by a SIMPLE Plan – little by little decluttering. I think I have done a fairly good decluttering job in my kitchen. ALL of my kitchen stuff is contained in my kitchen (no crock pot in the garage anymore) and I have empty space and drawers now. When you suggested decluttering one item from the kitchen awhile back – it made me think even more carefully and I decluttered about 12 mismatched ramekins. I realized I have other small bowls that can do what I used the ramekins for. Hi Vicki K, I just plant the seed but you are the one who tends to it in your own mind. You are doing a mighty fine job Vicki, give yourself a pat on the back. I was talking to a psychologist friend today and we were talking about this very idea. Her job is to plant those seeds of thought and encourage the recipient of her wisdom to nourish the ideas of a new way of thinking. Patients get into an anxious or depressed state by too often following negative thoughts. Likewise looking at our stuff with the idea of I can’t do without this or I can’t do without that is a negative thought pattern that will only end up with a cluttered home. Where as challenging those thoughts can yield a far better result of being willing to let things go. Hi Colleen! As I told you, my life is “ruined” ( 😀 😀 😀 ): No more 3 day crazy run to clean one room; no more useless stuff all around the house; no more taking more than 20 minutes to get dressed because I can’t find the clothes in my very messy bedroom; no more shopping for things I don’t need. Simple life is the best! Thanks Colleen! Dear 365ers. I’ve just passed my first 365 less things. Hurrah. I’ve got there in fits and starts. I’ve discovered the hardest part is the declutting of the thought process that has made me hang on to things well past my need for them. Once I’ve convinced my mind to change, the getting rid of the solid object is quite easy. In certain categories my mind has now started to flash up images of items that it thinks I should get rid off. The subconcious when left to a task is quite imaginative! I have kept a list of all the things I’ve decluttered and when I look back, I can’t remember most of them. Doesn’t that speak volumes about how unecessary they were? I’ve still got much more to remove but bit by bit and that’s fine as I’m a slow and steady sort of woman. Thank you all for sharing your stories; your success and less sucessful bits, on this adventure. Good luck to us all as we continue to simplify. Hi Sally and congratulations. Not just on your actual decluttering but especially on the realisations you have come to about thought processes. The psychological changes are the hardest and once achieved it is plain sailing all the way. Well done! Great post. Such clear points to help everyone decluttering their homes. I have been doing this for some years, continuing to take things to the Charity Shop as soon as I finish with them. At the moment I have started a methodical trawl through very cupboard and drawer! A little every couple of days so it’s not too much of a challenge and I get tired of the job. My intention is to declutter things that were kept the last time I did an in-depth clear out. Keep up the good work. Hi Linda, I have never really achieved a methodical room by room declutter. It was something I started a while back but stopped from lack of enthusiasm. Perhaps now that I am in my new home I should give it a go. There are less places to go through which makes it easier to begin with. I am sure I will come across things I am prepared to part with. Colleen, thank you for this post. I’ve been reading, but haven’t commented in ages. This really hit home for me today as I look around my house and see so many things that I need to clear out. My problem is that I want my house to be warm and welcoming, so I flip-flop back and forth with trying to decorate it and make it like my friends’ homes or homes that I see in magazines and blogs. Then, I read minimalism and simple living posts, and I want to throw out everything and move to a much smaller house (I admit that I do like the space in our house – just not all the stuff in here). I need to find a good balance. I’m not good at decorating at all and when I try to minimalize/simplify, it looks undone. If I try to decorate, it looks like I’m trying too hard and can’t make it work. Thank you and your contributors for continuing to write inspiring posts to help me get back on track with living a more simple lifestyle! Hi Toni, here is what I think about your situations. Perhaps the best decoration style for you is minimalist. Just Google ~minimal decoration style ~ and you will see that beautiful décor does not have to be cluttered. A couple of beautiful pieces in a room with minimal furniture and furnishing is a glorious thing. The beautiful pieces just pop! It also seems to me that you might be happier with less stuff and not trying to keep up with the Jones and images in décor magazines. Trying to be someone you aren’t is tiring. I would love to know what you think about this idea. Please reply. Colleen, thanks so much for responding! I do want to have less stuff. Things get overwhelming for me visually if I have too much stuff, plus the thought of taking care of it is not fun! After reading the book “Organizing Solutions for People with ADHD” by Susan Pinsky (I bought it because I have a son with autism, ADD, and OCD), I found myself identifying a lot with what she wrote. I’m not self-diagnosing, but I totally see how people who have ADD and ADHD think. Mrs. Pinsky advocated for minimalism/simplicity and gave good tips/solutions. I want my home to be visually appealing without being overwhelming. Thanks for the push to continue to simplify! 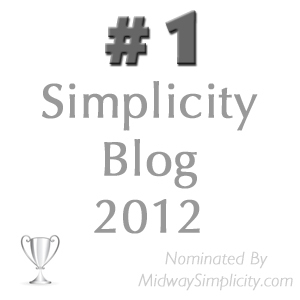 Your blog is one of my favorite ones to read! I will definitely try to find some images of minimal/simple decorating. I had not thought about having less stuff makes the beautiful things “pop”. I’m glad to have been of help Toni and wish you success at finding the best solution for you.